Nicola Crawford is a student in the School of Equine Herbal Medicine, she is also a Bowen and Emmett practitioner for humans and horses, has a Science Degree and is a Science Teacher. 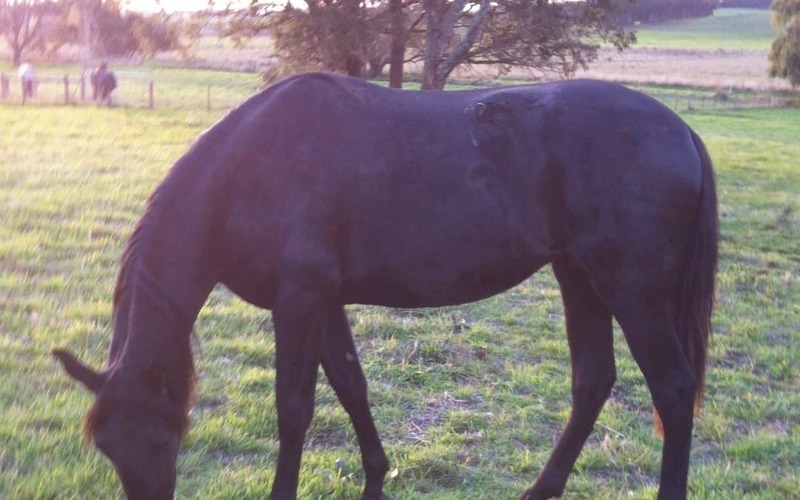 Nicola’s yearling Andalusian filly, Gotico Park Conella, damaged her pastern in the same place three times. Nicola takes up the story. 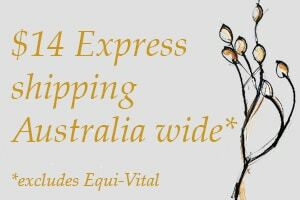 “The first time was a full skin depth vertical cut about 7cm long which was done on the journey down from Sydney to Western Districts of Victoria. The second time was a similar injury in virtually the same place, but about 5 cm long. This was just about healed when she opened it all up again. The third time was the worst because she effectively pushed the healed scar tissue (from the previous times) out. She had a full depth hole about 5cm by 7cm that was nasty. The conundrum was how she was doing this? 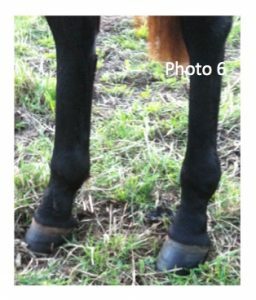 It was in the same place each time and always vertical down the pastern just on the inside front quarter. After watching her in the paddock for ages I concluded: It was not fence; she was not brushing and catching it with the other foot – no, she was standing on herself as she was getting up from lying down. 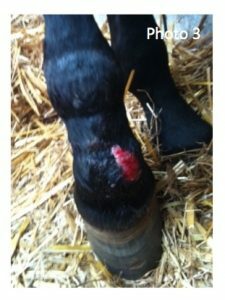 Obviously the leg had to be bandaged, fortunately she is a really well handled filly and nothing much fazes her. The leg took a good two months to heal to the stage of the last photo. It was in a bad spot for bandaging. 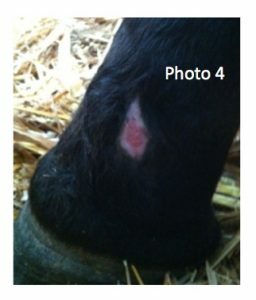 If the whole cannon was not bandaged, it would slip and “pool” around her fetlock and causing pastern to become sore. Bandage changes were 2-3 days apart, depending upon how the bandages stayed in place. The first pic in the series is taken after the large hole had filled – this took 2 weeks. Unfortunately I don’t have a pic of when she had just done the injury, but it was a mess. As you can see there is a lot of proud flesh, but the wound had to “fill”, as we could not get healing by first intention because it was too big. The subsequent pics are the wound healing. 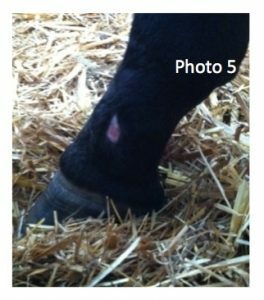 It took a long time and proud flesh was a problem because of the wound itself, the position on the leg and the fact that as she is a youngster, I did not want her to stay in the box. To help finalise the healing I used a small pastern boot with a pad to for protection of the wound because the bandaging was creating more of problem than it solved. My preference at that stage would have been to leave it uncovered, but that was not an option due to the stinking horrible flies that are here and also to stop her reinjuring herself. 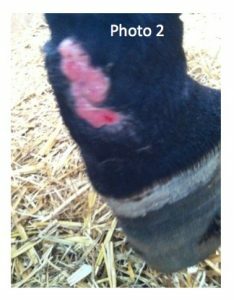 I am reasonably happy with it, although in hindsight (always a great thing) I would have been more aggressive in controlling the proud flesh and I would have also gone to the pastern boot with padding instead of the bandage earlier than I did. Nicola debrided the proud flesh herself, but it can also be done using a very fine layer of copper sulphate overnight, then washing off and patting dry in the morning and applying the skin balm and/or lotagen. On another note I am pleased to hear that Nicola did not take a picture of the original wound, as when one has to administer first aid, time is of the essence and taking pictures are a waste of precious time at that point.